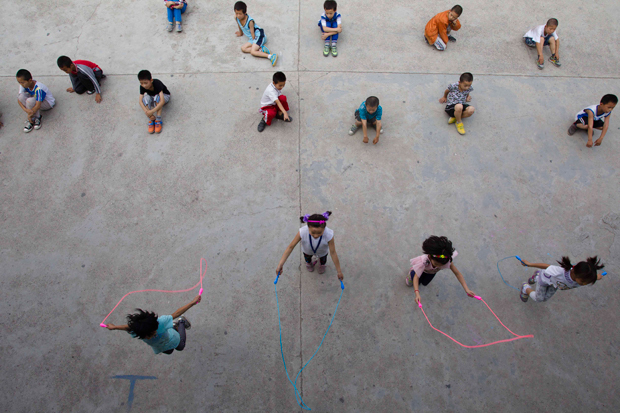 A group of children of migrant workers exercise in the yard of an illegal migrant school which has been ordered to close in Beijing, resulting in the children having to be sent back home to their provinces. Under China’s complex residency laws, most migrant workers remain registered in their native towns or villages and do not qualify for the all-important <em>hukou</em>, or household registration permit, in the city where they live and without this document their children do not qualify for places in public schools, making the unregistered fee-paying migrant schools their only option. Lurking silently behind practically every story on Chinese economic growth over the last thirty years has been the country’s unprecedented shift from being an overwhelmingly rural society to what is now a largely urban one, with almost 700 million urban residents now outnumbering their rural counterparts. Joining Kaiser Kuo and Jeremy Goldkorn to talk about the biggest migration in human history is Tom Miller, analyst at GK Dragonomics and author of the newly-published China’s Urban Billion. If you find this topic as fascinating as we do, join us for an in-depth discussion of why China has reluctantly embraced urbanization, and how the resulting pressures are forcing changes in China’s hukou system and land-usage rights, and ask with us whether these changes are pushing cities like Beijing into a new kind of urban dystopia.